I wanted to do something a little different this year with our homeschool preschool. Instead of planning our curriculum based solely on themes, I wanted to choose quality literature books that we could expand on for some fun, hands-on learning. 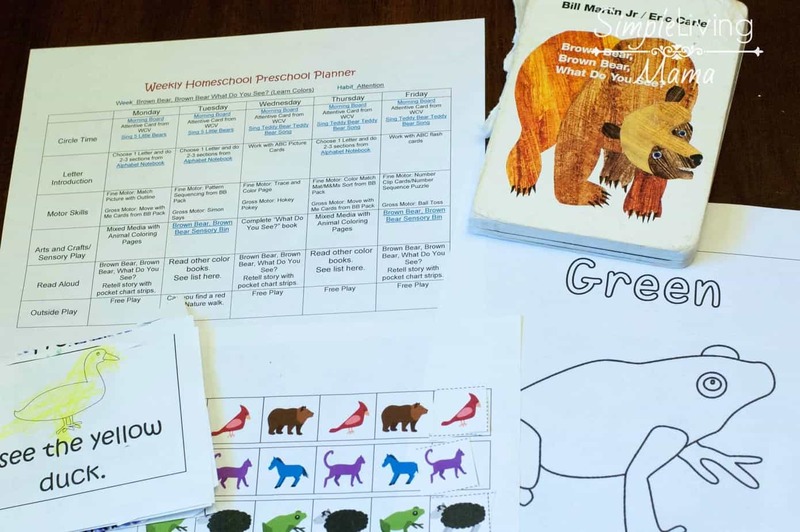 I love creating preschool lesson plans based on books. Our first book is Brown Bear, Brown Bear, What Do You See? because it has been such a favorite of my kids. These Brown Bear, Brown Bear, What Do You See? 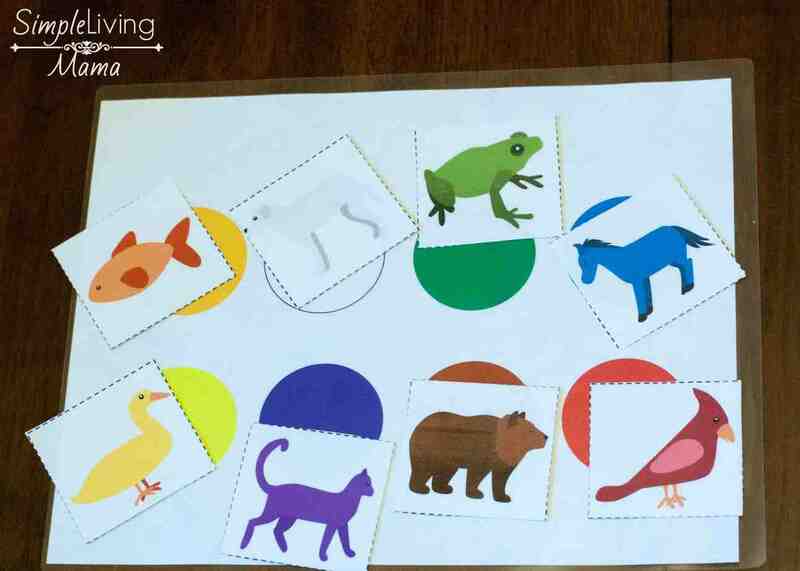 lesson plans and printables for preschool can also be used for kindergartners and are so much fun! I designed this preschool lesson plan to last one week, but because I am homeschooling older kids, I know that I will probably extend it a week or so. That’s okay, there are a lot of fun activities included here! All of the activities that are not included in the printable pack are linked for anyone looking for the specific activity. 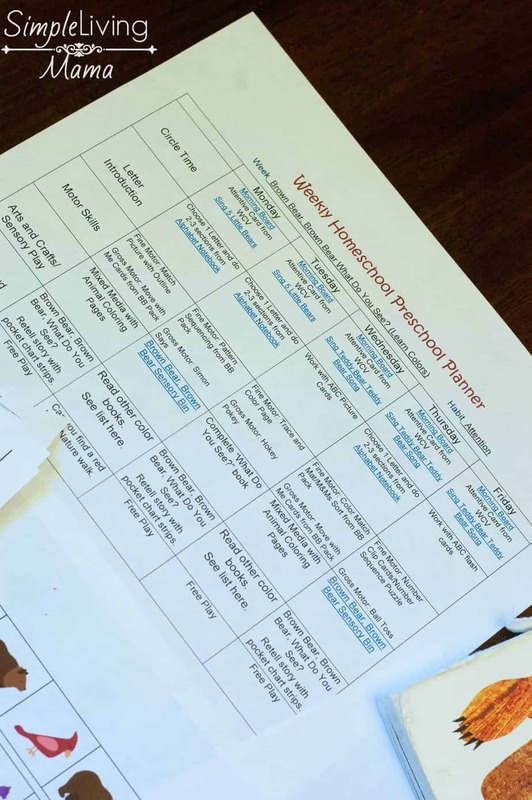 You’ll notice this lesson plan mirrors My Homeschool Preschool Planner perfectly. 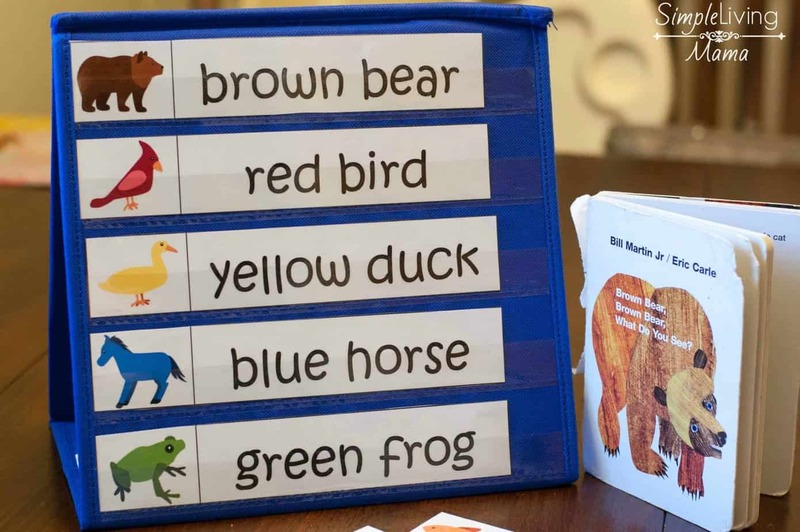 There are circle time activities, letter introduction activities, motor skills, arts and crafts, of course the read-aloud with suggested book list, and outdoor play, which is mostly unstructured. 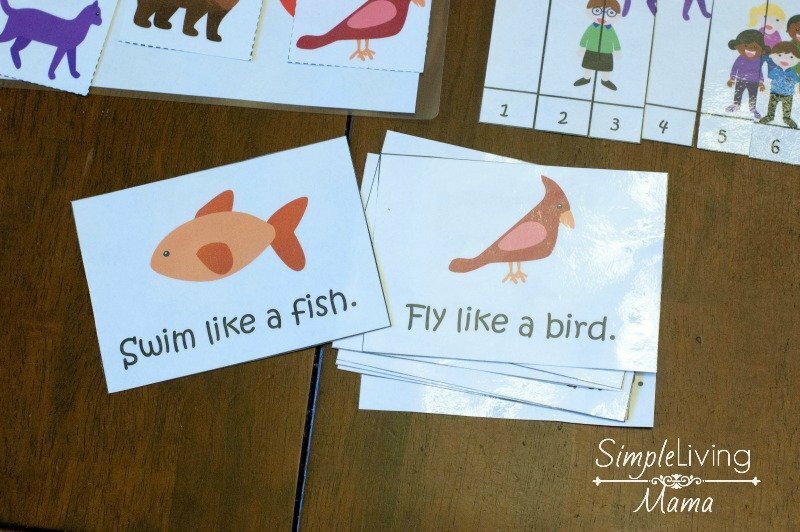 The printable pack includes activities for fine and gross motor skills, as well as counting, sequencing, and story retelling. 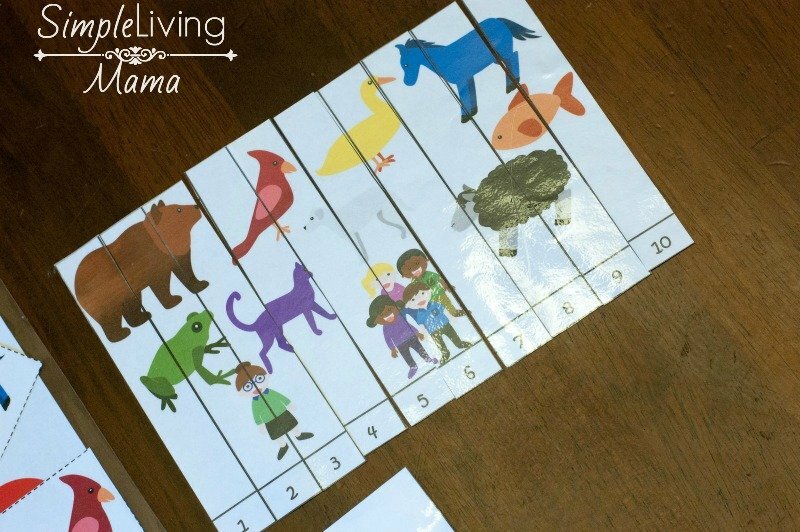 The pocket chart strips can be used to have your child retell the story. There’s also a fun color match mat that even my toddler enjoyed. Other activities we worked on included making our own What Do You See? book, completing patterns (including cutting and pasting), and we have several animal coloring sheets we will use for mixed media art projects. We will use paint, pieces of tissue paper, and glitter to color the animals! We worked on counting and sequencing numbers with this sequence puzzle. For gross motor movements we played a game with these cards. I would draw one and whatever the card said, the child would have to act it out. From now until 8-31-2017 you can get my Ten Apples Up On Top Pre-K/K unit study FREE when you purchase the Brown Bear, Brown Bear What Do You See? lesson plans. That’s two great books to read with your child and printables and activities to go along with them! Just use code PREK2017 at checkout! 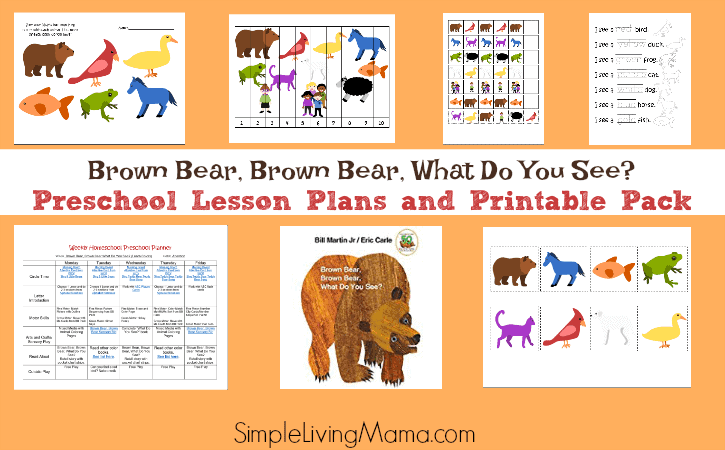 Just add the Brown Bear, Brown Bear Lesson plans to your cart. Then add the Ten Apples Up On Top Unit Study to your cart. Apply the coupon code and you’re all set! I have a much better idea on how to start my planning.